For 2019, we anticipate a further evolution and refinement of the 2018 trends but with even more explicit focus on the intertwined elements of sustainability, employee well-being, flexible working and biophilic and digital elements. In no particular order; these office interior fit out trends are all inter-related, all with a view of enhancing the workplace for people and the environment in 2019 and beyond. Digital transformation is here and only some businesses have well-defined strategies for implementing digital transformation. Part of a digital transformation strategy needs to include the office workplace and addressing the challenge of incorporating technology into them that enhances employee’s engagement and productivity. Workplaces need to be adapted to incorporate both physical technology as well as creating smart workspaces that enhance collaborative work activities, and core concentration areas. Another dramatic shift in the nature of work is Big Data, AI and robotics gaining more traction in the workplace, replacing routine and manual tasks. The coming economic disruption will be wide-ranging and deep-rooted. Already, many kinds of jobs are becoming obsolete. Human work is being redefined to focus more on analysis, creativity and insight. According to CIO magazine, digital technologies are empowering employees to shift their efforts to higher-value activities. The spaces and times where this creative, knowledge work takes place are also changing. Biophilia and sustainable office design are similar but not interchangeable approaches. 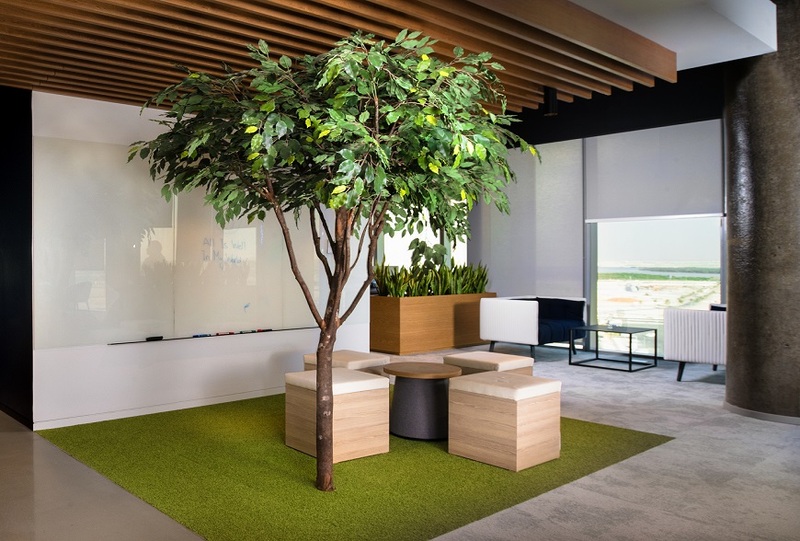 Sustainable office fit out focuses on protecting the environment by using green building materials, managing resource consumption and reducing harmful emissions; while biophilia focuses on incorporating elements from nature into design to benefit human health and wellbeing. The most sustainable offices will incorporate biophilic elements and the reverse. Biophilia means using more natural materials, like wood, stone, hemp, fibre, and others, as well as introducing features that reflect or mimic nature, like plants, water fountains and moss walls. Gensler, one of the world’s most high-profile design firms expressed the changing focus of design in this way: “We believe human experience is the future of design. People are the one constant in this era of dramatic technological change, demographic shifts, global volatility and climate change”. In the coming year, we also see that office fit out will be re-focusing on employees’ physical and emotional needs. As one of the UAE’s leading office fit out contractors, we have always been at the forefront of innovations in the area of sustainability. We understand that a focus on sustainability would be incomplete if it did not also include taking care of employees’ health, through providing healthy fit out using non-toxic materials, ensuring clean air flow, and proper ventilation, creating specific areas for eating, rest and reflection. Employee health and happiness leads to more productive and high functioning organisations. Small workplace changes like provisioning for employee control over temperature and employee choice of working space can have enormous benefits in attracting and retaining top talents. 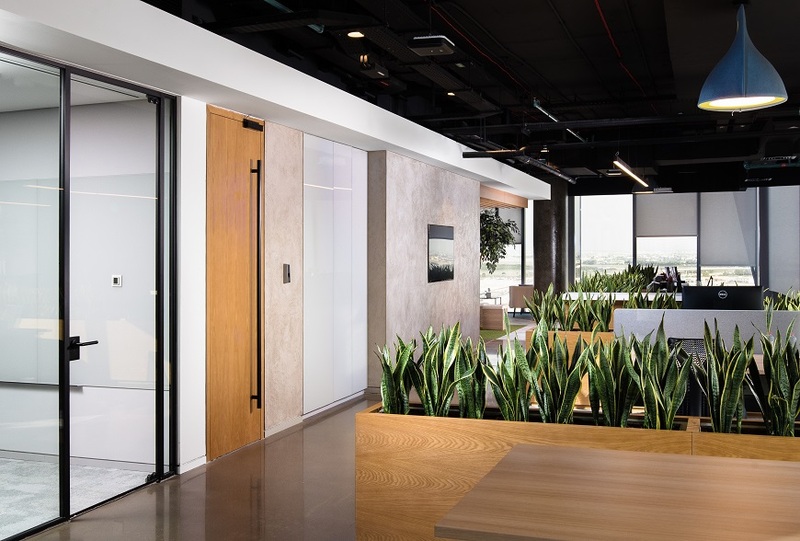 Technological innovations providing seamless connectivity and remote working are also allowing offices to include different kinds of space to accommodate different working styles. Co-working, where independent workers share a common space, is now a booming global trend. Co-working and micro-office setups are popping up everywhere in UAE. The benefits of “agile” working are also being adopted by more traditional companies. This is a design and fit out approach allows companies to use space more fully and efficiently, while also adapting to suit the different needs and working styles of a more heterogeneous workforce. The concept is to incorporate spaces for individual concentration, areas for group-based work as well as spaces for rest and relaxation, while providing a warmer and more welcoming atmosphere. The UAE is one of the top 10 countries outside the US in terms of LEED certifications, the world’s best known and most widely recognised green building rating system. At the same time, local certifications are also gaining in popularity. As companies become more convinced of the importance and social, economic and environmental benefits of sustainable fit out, we anticipate that there will be a growing demand for official fit out certifications. As discussed in a previous post, “Green” certifications assure clients that contractors are following the most up to date environmental standards throughout the fit out cycle including sourcing, and production of materials, installation, maintenance and clean up. They also offer up clear evidence to the outside world of a company’s commitment to and willingness to invest in the achievement of sustainable goals. One of our goals by 2020 is to achieve the WELL Building Standard accreditation, which is the first standard focusing exclusively on the health and wellness of people in buildings. We are now WELL-registered and are aiming to complete the certification process for our office interior in Dubai. And, we are sure that many more companies will follow in 2019. During 2018 we have extensively discussed in our insight posts The UAE and Dubai’s increasing focus on sustainability, especially the government’s new initiatives, regulations and guidelines designed to drive both companies and private citizens to become more aware of and more involved in safeguarding environmental resources for future generations. This year, perhaps, more than any before, the warnings of an approaching climate catastrophe, have become even more terrifying. Governments, agencies, companies and private individuals around the world are becoming convinced of the absolute necessity for us to act on a huge scale to contain global warming. For sustainable office design, these are the two most important and persistent themes: environmental sustainability, and work transformation. The who, what, where and how of work is changing due to digital transformation, wide-ranging economic forces, demographic pressures and environmental concerns. Office fit out is not only responding to these changes but helping to define them. Every year, we become more certain that creating a sustainable office is more than a passing trend. It is an expression of a change in the philosophy and value system of businesses, especially in the forward-thinking atmosphere of UAE. For us, sustainability is part of our ethos, our philosophy and our value system. We try to integrate sustainable concerns into every aspect of our work while helping our clients to see the tangible benefits to be gained from investing in sustainable design and interior office fit out. Want to know more about the new office fit out trends? Contact us today, and let us help you realise the workplace your business wants to enhance employee happiness and productivity in a sustainable way.